Spotify was the most downloaded Music app in Canada for 2018 with close to four million installs. 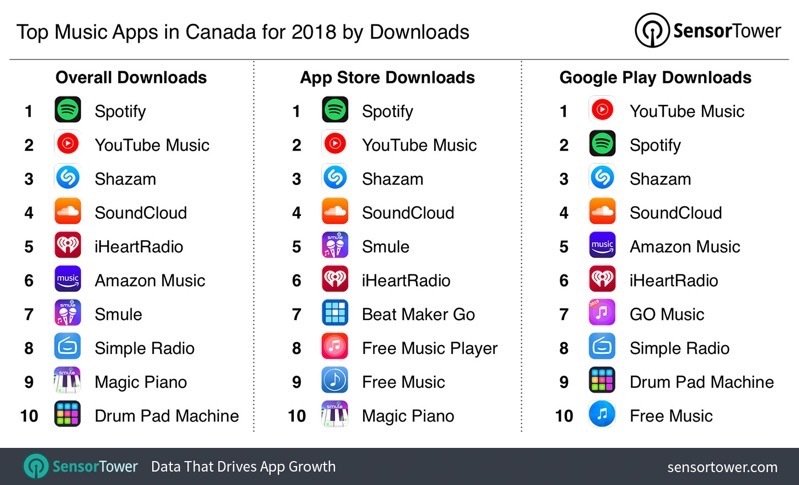 The full top 10 ranking of Music apps in Canada by downloads for 2018 is above. App download estimates are from Sensor Tower’s Store Intelligence platform. In second place was YouTube Music, followed by Shazam in third and SoundCloud in fourth. iHeartRadio was fifth and Amazon Music was in sixth place. Apple Music and other Apple apps preinstalled, along with those from Google, were excluded from the data, as the study only looks at unique installs. Spotify has recently been embroiled with a war of words with Apple, accusing the iPhone maker of being a “monopolist”.